Do you love camping, especially in the slower transitional seasons of spring and autumn, but hate having to deal with intemperate weather with only a thin nylon tent to save you from the elements? The obvious answer is to trade in the tent for a luxurious RV rental. Not only will the motorhome rental keep you dry, especially if you're exploring beautiful but wet places like the Oregon Coast this time of year, but you will be able to enjoy all the comforts of home like hot coffee in the mornings from your very own kitchenette. Renting an RV also means that if you're planning to drive along the coast you won't have to pack up all your gear after every stop, instead you can save that time for exploring the beauty of the area you've chosen to visit. One traveller who has discovered the convenience--and dryness--of the motorhome rental is avid camper Brian J. Cantwell who recently wrote a piece in the Times Colonialist entitled "Coastal Trip an RV Delight." Mr. Cantwell and his wife Barbara left their tent behind in favour of an RV on their last trip to the Northwest and the change was quite the revelation. "For this camping trip in the off-season, when 'Northwest' and 'rain' tend to be synonymous, the RV made all the difference. Rather than moan about packing up a sodden tent, we could look out from our home on wheels and scoff smugly at the rain," Cantwell writes. "And for RV camping on the Oregon coast, it's hard to beat spring or fall, when campgrounds open up, reservations aren't needed and you're not lumbering along in an endless parade of traffic on Highway 101." The RV rental not only made travelling in the off-season feasible, but it was also comfortable and quite economical, especially when compared to renting an SUV for the same journey. 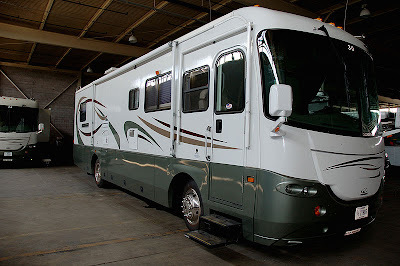 If you, like the Cantwells and so many others, are eager to explore in the off-season consider a motorhome rental to eliminate worry about the weather. For more information about roadtrips throughout the Pacific Region in the United States visit Pacific Motorhome Roadtrips.